[Update:] There seems to be some confusion about how zakkokumai is cooked and looks like, so I've added some more photos and such. 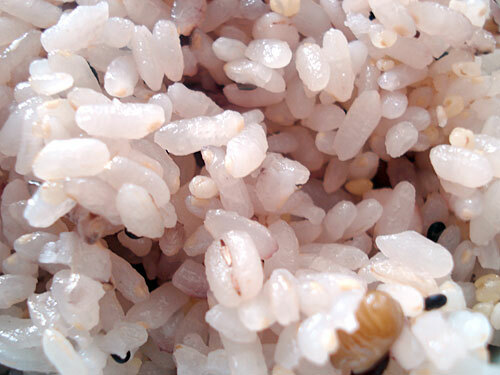 Rice is such an integral part of a Japanese meal, that the word for 'meal' (gohan, ご飯) also means rice. White rice is the norm, both for taste and for various cultural reasons. But as you probably know, white rice (hakumai, 白米） is rice that has been stripped of most of its nutrients, leaving just the starch. 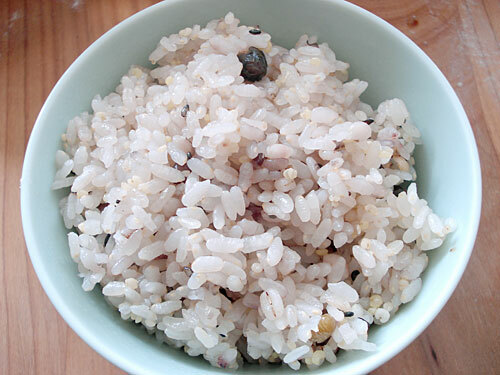 Brown rice (genmai) is the obvious healthier alternative. But brown rice can take some time to cook, what with the soaking and so on that's needed, and some people simply don't like the taste or texture. In recent years, something called zakkokumai (雑穀米）has become increasingly popular in Japan. Zakkoku just means "mixed grains", and mai is rice. Another name for essentially the same thing is kokumotsu gohan （穀物ご飯）. It's rice that has a small amount of various grains and seeds mixed into it prior to cooking. You can then cook the rice in a rice cooker in the normal way. The grains and seeds add a mix of nutrients and fiber, and a little flavor too. Zakkoku or kokumotsu mixes are sold in convenient packets. Here are two kinds; each pack is meant to be used for 2 to 3 cups (rice cooker cups) of white rice. You simply throw in the contents after you've washed the rice and put in the water for cooking. The light colored one contains sprouted brown rice, pressed barley, hatomugi (Job's Tears), millet (uruchi hie), and white sesame seeds. 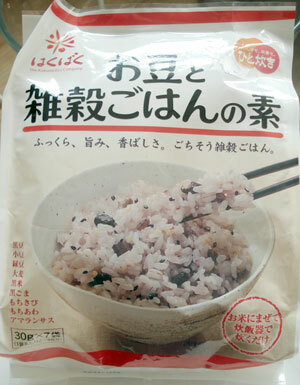 The package touts the fact that the whiteness of the rice is maintained, even after you mix in the zakkoku. The second one has black beans (kuromame), azuki beans, mung beans, pressed barley, black rice (kokumai), another kind of millet (mochikibi), yet another kind of millet (mochi hie) and amaranth. It colors the rice when cooked a slight reddish-purple. The good news is, these zakkoku packs are now more available outside of Japan. I've seen one kind at my local Japanese grocery, Nishi's, and and Japan Centre carries them too (link to the 'white' kind, and another kind here.) The bad news is that for those of us buying these kinds of things overseas, they are pretty expensive. If you're interested in trying out zakkoku-mai, look for these convenient packs at your favorite Japanese grocery store. If you can't find them though, try making your own mix of various grains and seeds, and add about a tablespoon per cup of rice. At the very least, it's an interesting alternative to brown rice. To clarify some confusion about exactly how a zakkoku-mai mix work, here are some photos of it being cooked. 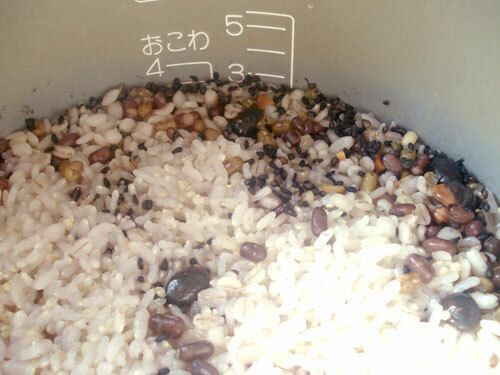 After washing 2 rice-cooker cups of rice, I added a packet of zakkokumai mix (this is the one with beans and things in it, described above) to the rice cooker with the water. There are about 2 tablespoons of mix in a packet. Here's how it looks after it's been cooked. I used the regular white rice setting, not brown rice or anything else! The mix is sort of clumped up in one corner, so I fluff up the rice to distribute things evenly. Here's how a bowl of cooked zakkokumai looks like. 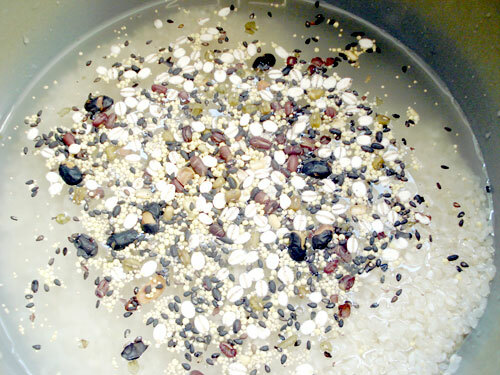 This mix puts a reddish color cast on the rice because it contains azuki beans and black rice, but the 'white' kind of mix puts no color on the rice. Here's how the cooked rice looks close up. It doesn't taste significantly different from plain white rice, though there is some texture interest. There's no need to devise special meals to eat it with either. We actually at this rice last night with curry. In any case I hope the photos make the use of zakkokumai a bit clearer. Submitted by maki on 2008-02-21 13:19. I made a zakkoku mai recipe from Elizabeth Andoh's Washoku: equal parts barley, quinoa, amararanth (I didn't add this), sesame seeds, flaxseeds, oatmeal, and/or poppy seeds. I added in some black rice I had too. I add about a tablespoon per cup of raw rice. It's really good. Because of the black rice, it turns the final dish purple, which is interesting. Any hints on the proportion of starches to legumes on this? I have one of the neuro-fuzzy Zojirushi rice cookers and was wondering what setting I would use to cook this type of rice mixture? Would it be mixed, brown...? That sounds very hearty and satisfying. Do you find that the mix of flavors in your zakkoku go with everything, like rice does, or are there certain combinations of zakkoku + other dishes that work better than others? sunny, the package doesn't say, but as freddy says, try equal proportions of say 3-4 different grains and seeds and see how it goes. anon, the zakkoku mixes can be used in rice with the regular white rice setting. Nico, zakkoku rice goes with anything that regular rice does. The taste tends to be a bit 'nutty', so the tendency is to want to serve it as part of a generally vegetable-oriented/healthy meal. Sounds like you could throw a handful of Kashi brand pilaf into the rice and accomplish something similar. It contains buckwheat, triticale, rye, hard red winter wheat, barley, oats, long grain brown rice, and sesame seeds. do the beans need to be soaked - how long? Maki - hi! I see on the azuki beans, you said, may need pre soaking, how about the black beans? If so, how long? I have no experience with cooking beans at all. Thanks. I don't recall seeing zakkoku packets in the Japanese grocery store I go to, but at the asian grocery stores, I see a lot of this kind of rice packets from Taiwanese companies. jn, the kashi pilaf sounds like a good mix (as long as it's not pre-flavored). Hasn't anyone made this in a rice cooker? I'm really curious to know what setting to use, too. Anyone?? Sarah, I've added photos to the original article which should make things clearer. You just use the regular white rice setting. Thank you, Maki. That explains things! @Wakkun: even with the brown rice setting, beans that have not been pre-cooked and dried still need to be pre-soaked (or at least they do with my rice cooker). according to my roommate, you should soak most beans for around 6 hours in the summer and around 12 hours in the wintertime—though it also probably depends on how warm your kitchen is, too. :3 if you're only using azuki beans, they don't need to be soaked as long—maybe half that time? I guess that the zakkoku mixes are geared towards shorter cooking times, but you could work around that by soaking the brown rice well (so that it cooks fast) and then adding the zakkoku mix just before you switch on. But it probably won't make a drastic difference if you just add things all at once. Try it out! I like to use the black long grain rice and mix it with brown, the more the rice is cleaned the less of the purple color soaks in. I think it adds a nutty flavor to the every day rice. I also do it a little South Asian and use cinnamon sticks, cardamom pods, and golden sultans. Everything goes in my handy dandy rice cooker and I have almost a meal when its done. I am going to try your suggestions, by the way the frozen tofu poached in vegetable broth and then fried with your teriyaki flavoring was a hit! Thanks! We have no problem cooking brown rice in a rice cooker, even on the speed setting (hakumei kyuusoku). Recently, I started eating brown rice, and surprisingly I enjoyed it very much. On lately, I decided to add sweet potato to the brown rice and it tasted just as delicious! Might consider adding other grain the next time. I haven't seen the white mix around, but I do get the other one frequently, cook it in the rice cooker with 3 cups of rice and love it! i have often seen the mixes in korean grocery stores and sometimes in chinese. not as much in japanese. so if you can't find these in a japanese grocery store, try a korean one. The rice i use at home comes in a package with, i think, eight different kinds of rice and grains. it has different kinds of purple, red, black, and brown rice, and barley and stuff. We combine this mixture with brown rice in our rice storage thing so that it is already pre mixed. I think the only difference with cooking it is that we use more water and let it sit for longer before opening the rice pot and eating it. I have an old rice cooker so theres no setting, just one switch for cook. My mom always manages to make it perfectly but mine always come out a little too dry or too wet. haha, i need more practice. i wanted to add that my rice comes out a pretty dark reddish color. sort of purplish reddish brownish. sometimes we add red beans or corn and stuff too. Thank you so much for such an amazing blog,maki! I would like to testify that consuming brown rice actually do helps in weight maintainance and weight loss.I'm currently a nutrition student studying overseas and sometimes do miss those food back home,[from south east asia btw].Ever since i read your blog and other nutritional articles about brown rice, i decided to give it a try since i'm a person who used to exclude white rice from my diet. The brown rice is normally prepared with zakkoku, i just love the texture and flavor of it. Besides,the unpolished grains help me to get through almost all day long without any thoughts for reaching out for snacks ^^ I feel healthier than ever and not being tried easily as i used to,even my host kiwi mother realised that and jeans hanging loose ard me now! congratulations on your weight loss! Fiber really is great for filling you up. Brown rice + zakkokumai = wow. I was able to purchased the same package of grains (as shown on the 1st photo, showning a bowl of rice and mixed grains on the packaging). I tried it today and make it with 3 cups of short-grain brown rice and using 1-1/2 package of mixed grain. I love it. I love the taste and texture of the rice. I enjoyed the rice eaten just plain on its own. I'm surprised someone haven't come up with a do-it-yourself multi-grain/seed mix. It seems to be very simple to mix your own mix. What are your thoughts? Sorry: If I read the entire blog above, I would have known that you have already explained about making your own mix and adding a tablespoon of mix per cup of rice. Each packet consists of 3 tablespoons of mix. I used 4-1/2 tablespoons of mix for 3 cups of brown rice. I think I will try making my own mix. Thank again for your post. I have been frantically searching for the standard nutritional table values for Mixed Grains. I realize they will vary based on exactly what the mix is. But do you have the table that I can use as I need it to monitor strict dietary requirements (the one on the package I got is completely incorrect!) Thanks. Hi Maki, your blog is really complete and I found myself trying a lot of the recepes. I want to ask you, I do not have a rice cooker and I cook most of the time genmai, if I make the mix myself, for cooking, the cantity of water is the same? With the small amount added as suggested there's no need to adjust the amount of water. Just cook your rice as normal and it will work. I've made this kind of rice on the white rice setting of my rice cooker. Turned out fine and you don't need to soak the beans from the ZSakkokumai packets. 2. Cooked the above using maki's instructions: using the pressure cooker, get it up to pressure then cook for 25 mins. I left it to go down to pressure naturally and it came out great! Hope that helps someone! I'm searching for other ways to use my mixed dry beans. Any suggestions are appreciated! That's an interesting story about white vs. brown rice. My father was the same on the bread side. He only would eat white bread, since he had to eat whole wheat flour bread during world war 2 (they were farmers, used their own grains, baked their own bread, probably without the shelfing and some other restrictions like ration stamps the non-farmer population had). As kids we had a hard time to buy the whole wheat bread since he loathed it, even though we loved it! But nevertheless, she still enjoyed it.